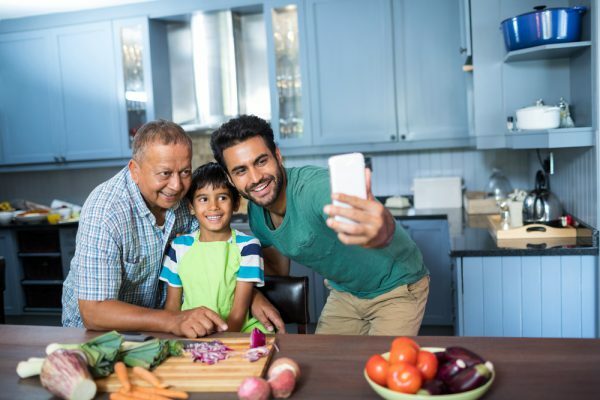 In a world where we’re constantly urged to “make memories” and to “make every moment count,” it can be tempting to look around the dinner table and wonder whether what we’re doing is enough. Will the kids look back in 20 years and think fondly of the meals we’ve shared, or will they have forgotten everything except that one epic food fight (in other words, the one meal together you’d rather forget)? Feeling the pressure to make every forkful of spaghetti Instagram-worthy is understandable, but it’s also unnecessary — and could even sabotage your ability to create the kind of family dinner memories you really want. Read on for our thoughts on making memories at the table, and why putting in extra effort to make dinnertime “memorable” may not really be worth the stress. Think back to your own childhood. Chances are, like most of us, you were poked, prodded and posed in photo after photo of occasions that were supposed to be memorable and special. But how many photos do you have that show the laughter you shared with siblings in the backseat, playing with friends at the park, sipping cocoa with your grandmother, or any one of hundreds of other unscripted, unremarkable moments that you think back on fondly? The truth is, some of life’s best moments happen when nothing special is planned. Relax, let go of any pressure to make things perfect, and just sit down to dinner together. That’s where the magic happens! Don’t let distractions derail dinner. You can’t remember what you didn’t truly experience, so slow down and focus on listening and being mindful during meals. Don’t worry about what chores might be waiting once dinner’s done! Instead, try to challenge yourself to notice or learn one new thing about someone at the table each night, to help train your brain to take in all of the good stuff that goes on during dinner when you’re really tuned in. We found this great idea in Your Teen Magazine: Ask teens (and tweens) to teach you how to play their favorite games. Sure, there may be some screen time involved, but add a big plate of healthy snacks that you can munch while playing, and you’ve got a great opportunity for eating and bonding — no forced “memory-making” required! Meet the Lorenz family from Florida! Loren and Art are trying to fit in their memory-making at the table around their boys’ demanding sports schedules and the added challenges of preparing a senior for high school graduation. 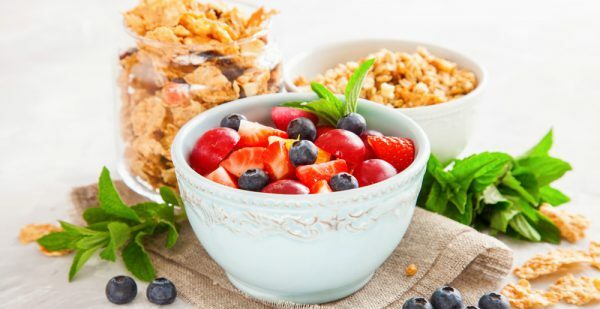 Speaking of making memories, try this easy, nostalgic family recipe for Swiss Muesli as an easy make-ahead breakfast, snack or breakfast-for-dinner treat! 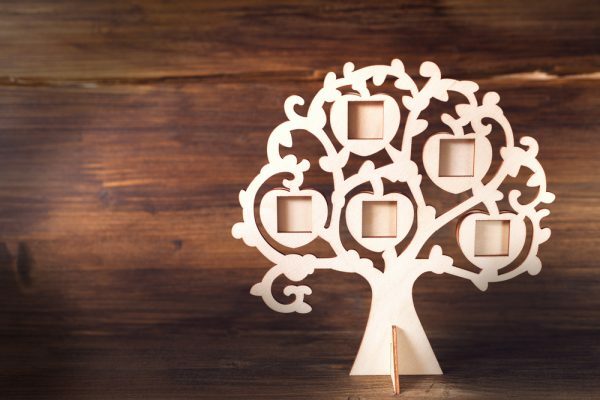 For a more hands-on way to take a trip down memory lane at the table, try this family tree activity — especially good for larger gatherings. 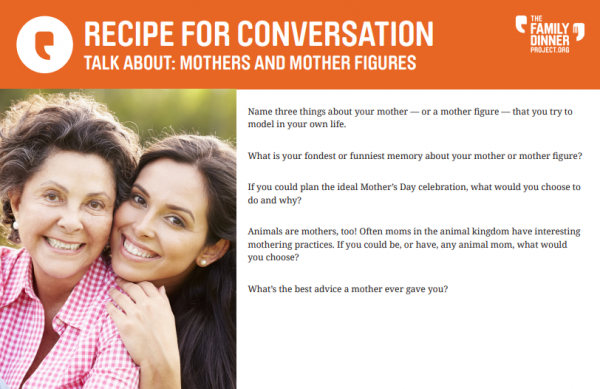 Planning to honor a mother or mother figure this month? Make it memorable with our special conversation starters.